“God scratches where the world itches,” says nervous Pastor Mervin Oglethorpe (Brian Mackey) of North Carolina’s Mt. Pleasant Baptist Church. That’s by way of a vamp, since the stars of the church’s first-ever Saturday night sing-a-log are late. Unfortunately, vamping isn’t the good pastor’s long suit, so he spends considerable energy looking out the window, hoping to see the Sanders family. Finally, they arrive, apologizing all over the place. Seems their van overturned in a ditch next to the local pickle factory (source of more than a few jokes) and they had to wait for help. 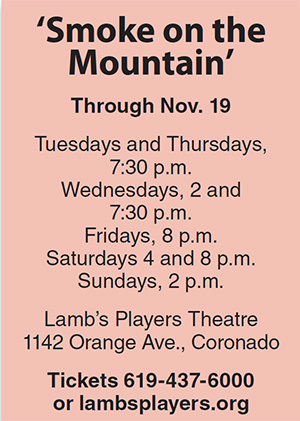 Lamb’s Players Theatre brings back the seventh edition of one of their most successful shows ever – Connie Ray’s toe-tapping, hand-clapping bluegrass/gospel hootenanny called “Smoke on the Mountain” — for a run through Nov. 19, directed by Kerry Meads. Cast your mind back to 1938, when life was a lot more black and white than it is these days. Baptists didn’t dance (I hear they still don’t), women wore seriously ugly housedresses and didn’t work outside the home (though Rosie the Riveter wasn’t far off), and most activities that “nice” Christian families engaged in were, well, family oriented. Apparently, Baptists also didn’t make as much noise as this group does. 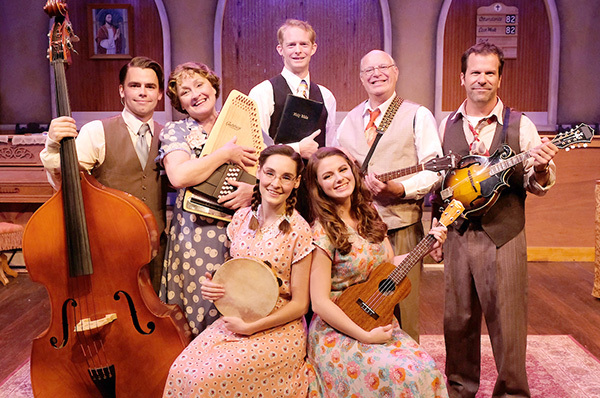 The poor pastor tries to keep the Sanders gang under control, but there’s no hope; with four singers and a band consisting of bass, guitar, mandolin, ukulele, tambourine, piano and several oddball percussion pieces (see below), this is a musical hurricane that can’t be stopped. This cast is different from the last iteration (2010), except for Deborah Gilmour Smyth, who seems to have a lock on Sanders matriarch Vera. This version is a tad too cloyingly obsequious for my taste, but she has plenty of splendid musicality to contribute. Vera’s husband Burl is played by Rik Ogden this year. Usually seen in the band, Ogden is a welcome presence, demonstrating both musical and acting chops. Steve Gouveia, frequently seen on local stages, is excellent as Burl’s brother-with-a-past Stanley. Annie Buckley plays big-voiced Denise Sanders, who has Hollywood ambitions and is waiting for a callback from Selznick. Her twin brother is just the opposite; shy, diffident, and with hopes of becoming a preacher, Dennis (newcomer Beau Brians) can barely get a sentence out. June Sanders, the “non-singing” member of the family, is played (somewhat ironically) by Katie Sapper, who is known to sing just fine, thank you. But here she says, “I don’t sing, I sign” and limits her musical contributions to the percussion section, playing coconut shells, a washboard, tambourines and a Quaker Oats box with coins inside. 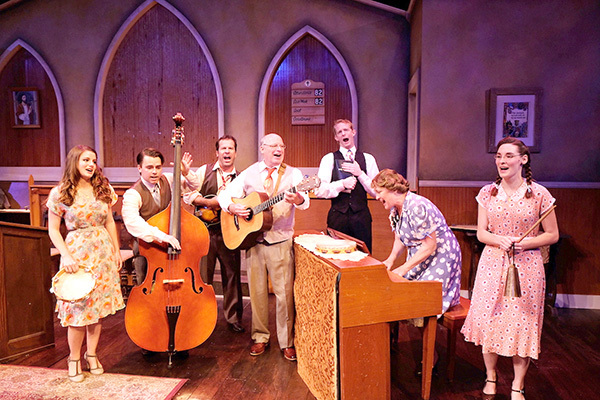 This show is more Pentecostal revue than play, and audiences respond accordingly, clapping along and voicing frequent approval. If you’re a hootenanny fan, and fond of gospel and bluegrass, this show’s for you.